Before anyone gets the wrong idea and thinks I’m using and reviewing a brightening serum to make my skin lighter, no. I have had years and years of acne and as a result of it I have hyperpigmentation. Most noticeably my forehead is considerably darker than the rest of my face and in recent months it’s really started to bug me. When I was given the opportunity to review Skinbreeze Brightening Serum it felt like a godsend. Skinbreeze claim the science behind their innovative product it is that “combines alpha arbutin, Melanostatine®5 and TyrostatTM together with a human growth factor peptide that blocks melanin synthesis to reduce the formation of unwanted pigmentation.” I did a little research on the 3 listed ingredients and found that in high quantities the above components can have pretty awful side effects. Luckily in the brightening serum they’re only a miniscule amount so it seemed safe enough to use. As I mentioned before my forehead is my main area of concern. Even though I was eager to see what kind of results I would get, I was still slightly apprehensive because usually if I put any kind of product on my forehead, especially makeup I’m guaranteed to get spots. It was a bit of a risk but after some consideration I decided to give it a go. 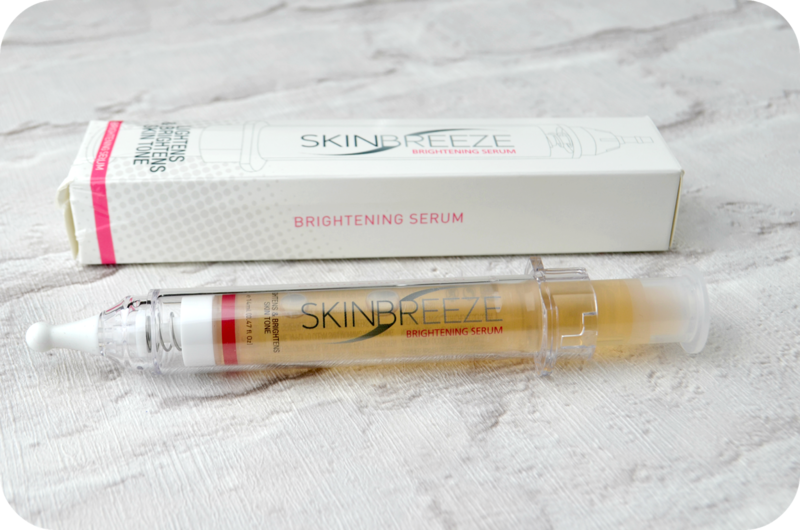 The packaging for the Skinbreeze Brightening Serum is pretty cool because it comes in a syringe shaped tube, something I’ve never seen before! The instructions are very simple – remove the rubber cap and squeeze some serum on to your fingertips, then work it into your (clean) skin morning and evening. The serum is transparent with a yellow/orange tint to it. The consistency is very watery so you only need a very minimal amount to spread across your whole face. Since I was only using it only forehead and a bit on my chin I needed the tiniest of squirts. Due to the consistency, it’s so easy to work it into the skin. I didn’t find there was any smell to the serum so no artificial fragrances in there. The product didn’t feel greasy or sticky but after a few minutes I did feel a very slight stinging sensation. This feeling fades within a few minutes and I’m not left with my skin feeling weird or tight. I started off using the serum in the evenings only, because I didn’t want to aggravate my skin and break out. After a week, there was no sign of any spots forming so I gradually introduced it twice a day. Skinbreeze state that results should begin to show after 3 weeks. I’m well into my third week and I can see a slight improvement in my skin tone. I used a small amount on my chin too where I had a few marks left by blemishes I had a month ago. The serum worked wonders on my chin and the marks have completely gone. My forehead however is taking a while to show similar results but for me that is expected as it’s years of hyperpigmentation, but there is definitely some brightening going on. I’m optimistic though! I’ve almost finished my serum and I would most definitely purchase this product again and recommend it to others too. Skinbreeze products are currently only available are approved clinics and salons. Luckily there are a huge number of places across London (check your nearest salon here).